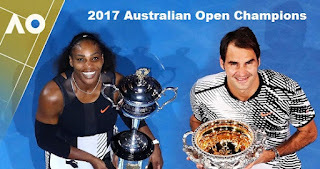 The 2017 Australian Open was a tennis tournament that took place at Melbourne Park between 16–29 January 2017. It was the 105th edition of the Australian Open, and the first Grand Slam tournament of the year. The tournament consisted of events for professional players in singles, doubles and mixed doubles play. Junior and wheelchair players competed in singles and doubles tournaments. Novak Djokovic and Angelique Kerber were the defending champions and both were unsuccessful in their title defense; they lost to Denis Istomin and Coco Vandeweghe in the second and fourth rounds, respectively.For the first time since the 2004 French Open, both No. 1 seeds lost before the quarterfinals, with both Andy Murray and Angelique Kerber defeated in the fourth round. Roger Federer won his eighteenth men's single Grand Slam title by defeating Rafael Nadal after a five-set final – his first major title since 2012.